I’ve been woodworking using only hand tools for a little over 15 years now. Though I still enjoy every part of the process, I’ll be the first to admit that there are times when doing all of my woodworking by hand can be a real chore. Long rips in really hard, or really thick stock and resawing are two such times that come to mind. Even with the right saw, these kinds of tasks can be real drudgery. However, there are important lessons to be learned in some of the “grunt work” that needs to be done as part of each project. One of the most important lessons that breaking down stock with hand saws has taught me is the importance of sawing accurately and very closely to, or dead on, my layout line. In the modern world of shoulder planes, joinery floats, and shooting boards that allow making adjustments in thousandths of an inch, sawing so precisely may not seem like a real need. So why is this such an important skill, you ask? One word…efficiency. If I saw this shoulder fat, I need to spend time cleaning it up with a chisel or shoulder plane later. But if I just saw right to the line, straight and plumb, the joint should be gap free right from the saw. I’ll give you an example. Let’s say that on the typical project, you rough cut your lumber with a chop saw. Then, after you flatten and thickness the stock, and straighten and square one edge, you rip it to width, and finally cut it to finished length on the table saw. All the grunt work is done by your machines, and now you can focus your hand work on the joinery. After carefully laying out all of your shoulder and cheek cuts, you pick up your trusty backsaw and get to work hand sawing some tenons. However, you find it a bit challenging to get dead straight and square shoulders and cheeks so you cut everything a little bit fat of the layout line. 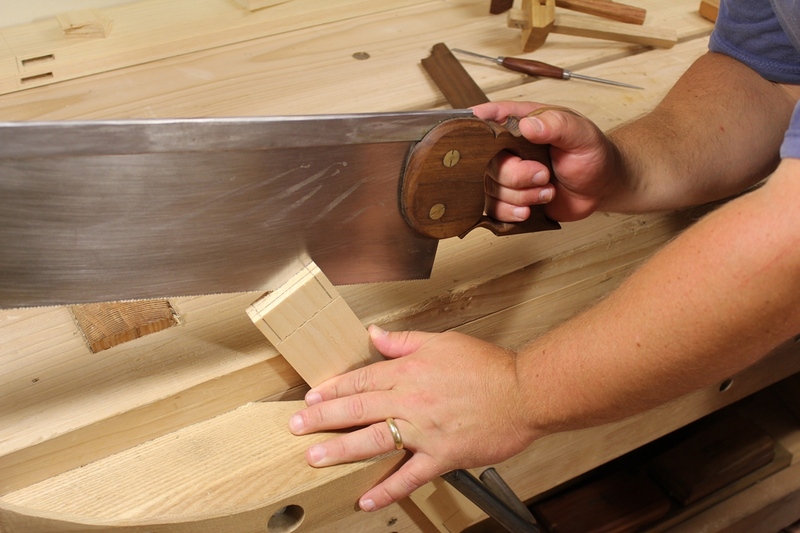 With all of the saw cuts made, you take out your shiny shoulder plane and your joinery floats, and settle in to spend the next hour or two adjusting each tenon to fit its mating mortise. As anyone who has done this can attest to, the process of constantly trimming and checking the fit of a joint is painfully inefficient. In fact, all of the time that was saved doing the grunt work with machines ends up lost to the repetitive process of adjusting the fit of every single saw cut. Furthermore, continuously fiddling with the sawn surfaces rarely results in consistent, tight fitting joinery. Instead, unsightly gaps and sloppy results are more commonplace. The solution to this problem is, of course, to make your saw cuts very precisely, right to the layout line. However, when 95% of the sawing that a person does is completed with the assistance of power and guides (fences, miter gauges, etc. ), they frequently lack the practice and the confidence to go for an “off the saw” fit. 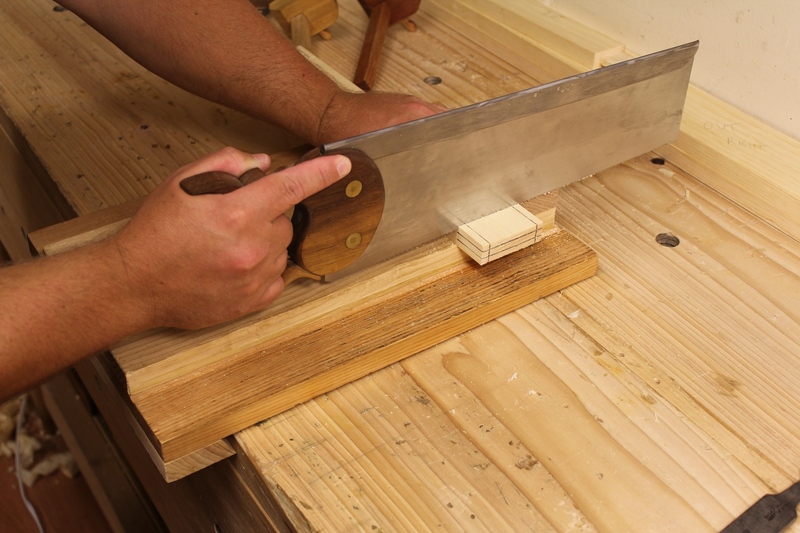 Commercial jigs and gizmos to help guide your hand saw may seem like a good solution, but they’re little more than a crutch, and do nothing to train the hand and eye to work together. Making longer cuts with a long hand saw provides an opportunity to practice sawing to a line before you get to the more critical joinery cuts. Using long hand saws to break down stock, however, provides an opportunity to train the hand and eye with less risk, because the boards are likely to be processed further after the cut anyway. It’s also much easier to see, feel and confirm that your body and eye are all in line with the cut with a long saw and a long, straight layout line. Just like winding sticks magnify the twist in a board, the length of a long saw blade alongside of a long layout line magnifies any error in your setup before you even start the cut. And as any good sawyer knows, getting started straight and true is the most important part of the cut. The other thing using long hand saws to break down stock teaches you is to be more efficient with your saw cuts. When I saw my rough stock, I consider it practice for more critical cuts. When I’m ripping a board to width, the further I stay away from my line, the more work I have to do afterwards with the hand plane to clean up the cut and get down to that line. If I’m cross cutting, cleaning up means planing end grain, which is no fun in anything harder than cherry. So instead, I saw as tightly to the line as I can with the goal of cleaning up the saw marks from the rip cut with just a few swipes of the plane, and avoiding cleaning up crosscuts at all if I can. 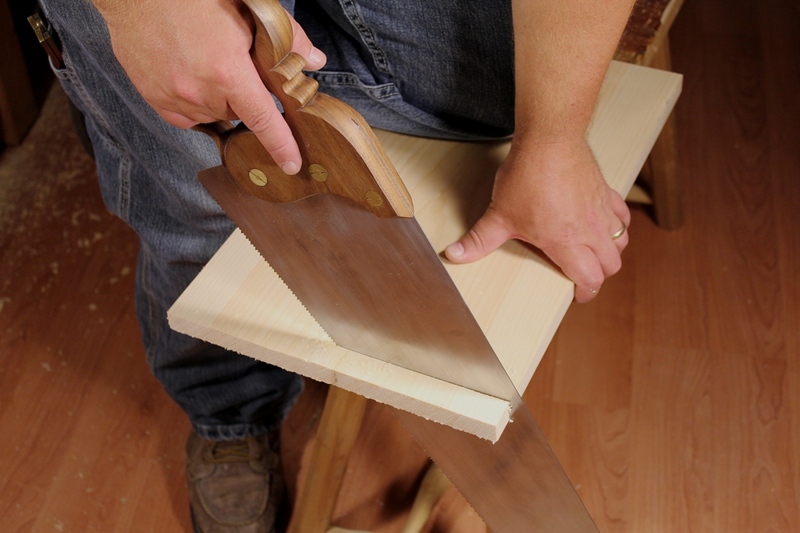 Practicing your sawing with long saws doesn’t have to mean completely abandoning your table saw. You don’t need to rip 100 board feet of 8/4 oak to see the benefit of practicing with long hand saws. There are simpler opportunities for you to practice in almost every project. For example, make your rough crosscuts by hand. These cuts are quick and easy but provide a great practice session for sawing to a line. The final length is typically adjusted later in the project anyway, so if your cut is not perfect, it likely won’t matter. Another great opportunity to practice your hand sawing is with your secondary parts like case backs and drawer sides. These parts are commonly made of softer, easier to saw woods like pine and poplar, and most are not visible after assembly, so a minor “oops” is unlikely to show. After a little practice with long hand saws, you’re joinery cuts, like this tenon cheek, will come out cleaner, straighter, and more precise. Being able to saw to a line is a skill that takes practice. If you don’t do any hand sawing but short joinery cuts, you won’t get enough practice to saw straight and true consistently. However, start doing more with long hand saws and I gaurantee you will be tracking a line better in very little time. Of course the real benefit of this will be the improvement you see in your hand cut joinery. Your tenon shoulders and cheeks will be cleaner and straighter, your dovetails will be tighter and you will do much less adjusting of your joinery, which saves a lot of time. Before you know it, you’ll be going from the backsaw straight to assembly, which should be the ultimate goal in hand cut joinery. Keep practicing! It is achievable. Posted in Cutting Joinery, Hand Saws, Sawing, Skills and tagged better hand cut joinery, dovetails, sawing to a line. Great article Bob. Thanks for the encouragement!